Definition at line 61 of file llmessagethrottle.h. Definition at line 76 of file llmessagethrottle.h. Definition at line 77 of file llmessagethrottle.h. Definition at line 74 of file llmessagethrottle.h. Definition at line 75 of file llmessagethrottle.h. Definition at line 73 of file llmessagethrottle.h. Definition at line 52 of file llmessagethrottle.cpp. Definition at line 56 of file llmessagethrottle.cpp. Definition at line 132 of file llmessagethrottle.cpp. 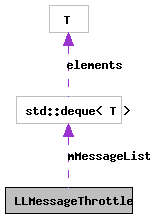 References eq_message_throttle_entry(), FALSE, LLFrameTimer::getTotalTime(), mMessageList, MTC_AGENT_ALERT, and TRUE. Definition at line 103 of file llmessagethrottle.cpp. References eq_message_throttle_entry(), FALSE, LLFrameTimer::getTotalTime(), mMessageList, MTC_VIEWER_ALERT, and TRUE. Definition at line 60 of file llmessagethrottle.cpp. References FALSE, LLFrameTimer::getTotalTime(), MAX_MESSAGE_AGE, mMessageList, MTC_EOF, S32, and TRUE. Definition at line 78 of file llmessagethrottle.h. Referenced by addAgentAlert(), addViewerAlert(), and pruneEntries().